"We have never had any problems with N-Focus support and technical staff; they have always handled issues quickly because they are truly interested in and always listen to customers." "N-Focus fits great for Avaya Call Centers needing reporting but maybe can't afford the price tag of CMS or they don't need all the capabilities of CMS. Providing an easy-to-use web interface in N-Focus has also proven to be a great migration path for Avaya BCMR-D users as well. 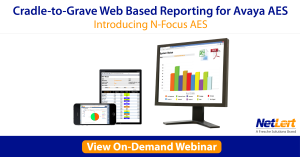 I have recommended N-Focus for years now to clients needing an easy-to-use, web-based, turn key reporting tool." "The abilities for our client to access data based on privileges and to view real-time stats via the web is critically important in our relationship as an outsourced call center." "Our Clinic Managers like the ability to do on-demand reporting when they have an issue to resolve. They also like to set up their own recurring reports for ongoing monitoring. I like the fact that I can set up access on a per user basis and Managers don't have to depend on my schedule to get their reports." "We began using BCMR and it caused problems. Manual report generation took too long for call center manager. We needed an easy-to-use, real-time tool. N-Focus significantly reduced call center manager's time to pull and format reports. Automatic Adobe and Excel emailed reports made a big difference for the call center manager." "N-Focus Plus will save staff time and effort on an ongoing basis, which will pay for the product. On top of that, the automated alerts will improve our customers’ experience...A junior ACD coordinator was able to use N-Focus Plus to collect and evaluate data in less than two hours, then provide a management report that answered a productivity question that we couldn’t answer before." "We have been using the N-Focus software for years and love it! It is very intuitive and easy to use and offers a superb alternative to the very expensive Avaya solution. The technical support teams are very responsive and always a pleasure to work with." Fortune 500 Search Engine Company Finds N-Focus Plus, Deploys Worldwide to more than 16,000 agents. "The N-Focus solution makes our Avaya switch very powerful in the call center environment. I highly recommend the N-Focus product for any Avaya-based call center that needs a user-friendly web-based reporting tool." "The NetLert system has helped us to easily monitor the usage patterns and problems with these efforts. It helps us to continue improving our outstanding customer service our patients like and have come to expect from us." 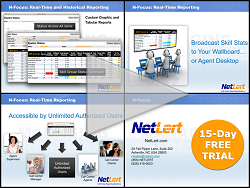 Founded in 2000, NetLert specializes in performance analysis and reporting solutions for Avaya-based contact centers. Today, NetLert Communications is uniquely positioned in the market place, providing products based on leading-edge technology to Avaya contact centers of all sizes. NetLert is a division of Fresche.